Regular readers of the website may have noticed that I use the words “terrific” and “wonderful” in almost every Workspace of the Week description. I didn’t realize I did this until a co-worker pointed it out to me, and now I cringe at the sight of those words in my writing. They’re stale and lack the punch of much more descriptive choices. Terrific! Wonderful! Ugh. The more I think about these vocabulary crutches, the more I realize I have similar crutches in other areas of my life. Some of these crutches are good — like when I need a friend to listen, I turn to the same trusted people again and again — but others aren’t so positive. In fact, most of my crutches create clutter in my life. For example, when I am really busy at work, the first thing I cut out of my day are magazine and newspaper reading. All incoming magazines are stored in a “to read” Stockholm project case and hang out with the idea that I’ll read them when things calm down. Except, when things calm down, I have that day’s reading materials to tackle and not enough time to read two week’s worth of information. I have a project case to hold my “to read” materials, but no set plan to ever empty the case. Weeks and months pass, the box becomes jammed packed, and I end up tossing the materials straight into the recycling bin without ever looking at them. My crutch is this box, and all it does is create clutter. Each day for the next seven days, I’m going to try to eliminate one clutter crutch from my life. I’m going to look at how the problem came to be, what is wrong with the situation, and how I can change my behavior to immediately deal with the clutter. I’m also going to try not to use the words “terrific” and “wonderful” in my writing or speech. 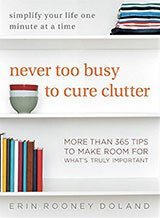 What clutter crutches do you have in your life? 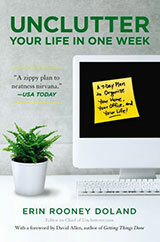 If you’re game, make a seven-day commitment with me to banish these clutter creators! This week’s entry isn’t a workspace in the traditional sense, but I can only imagine that this area sees a lot of work. 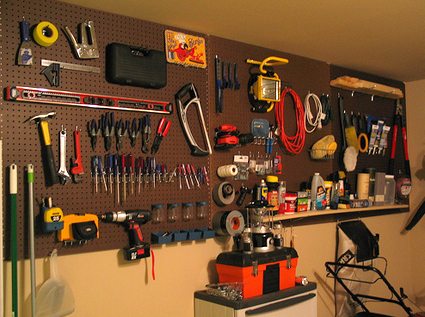 As per our site motto, there is a place for everything, and everything is in its place. Before the weather gets warm, you may want to take Jake’s lead and get your garage ready for summer use. Thank you, Jake, for creating such an inspiring space. Could your productivity benefit from a professional nagger? We’ve talked in the past about how nagging the people you live with is never a good idea. It’s disrespectful, it upsets you, and it usually angers the person you’re nagging. But, what if the situation were different and you chose to have someone nag you to keep you from procrastinating? What if you didn’t have any kind of an emotional or physical connection to the person who was nagging you to keep moving? Last week, I learned about just such a person — a professional nagger. Her name is Rachel Cornell and people pay her to nag them. She offers a daily nag, a power nag, an on-going nag, a week-long nag, and a community nag. She even has troubleshooting services to help you get over your bump in procrastination. I must be honest, I was flabbergasted to learn that she offered so many nagging options. One of the reasons I think a professional nagger is an effective idea is because there isn’t a prior relationship between you and the nagger. You don’t have to sit down to dinner with your nagger. You don’t have to worry about what your nagger thinks of you. You have a business relationship with this person, and nothing else. After learning about Rachel, I did some research and learned that there are hundreds of professional naggers available to nag at people who want their services. If you’re in the market for a push to keep you from procrastinating, do a search for “professional nagger” on Google to find one who might work best for you. What do you think of a professional nagger? Would you ever use such a service? I definitely think I could have used one in college. I recently returned some compact fluorescent light bulbs (CFLs) to my local hardware store because they were too dim and white. The traditional bulbs they replaced had been much warmer and brighter, and I prefer this kind of light. Table and floor lamps: Compact fluorescent in warm white. Reading and Task Lamps: 23-watt CFL in warm light or daylight. Recessed Fixtures: CFL in warm white or a halogen. Energy-saving bulbs have adopted the shapes, sizes, and appearance of traditional bulbs, making it easier to phase them in. When in doubt, opt for a warm-white CFL, 3,000 degrees Kelvin or lower. 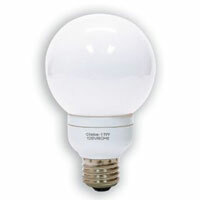 It has the color quality most associated with traditional bulbs. This color temperature is best avoided. It washes out skin tones and makes reds, oranges, and browns look muddy. In general, you should use a daylight bulb only in a reading or task light. 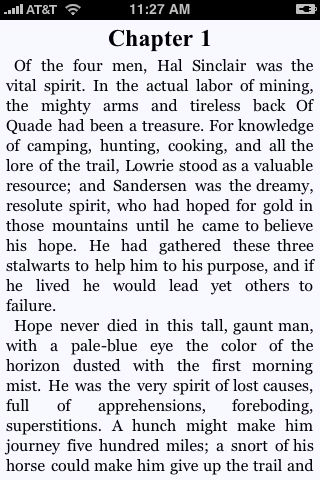 The cool, bright tone makes text jump off the page. The size and shape of CFLs has changed over the years and there are many more options for decorative lighting. There are globes for vanities and candle shaped bulbs for candelabras (with adapters). To learn even more, read the full guide from Martha Stewart Living. Let me start off by saying I have nothing against time capsules, but lets face it they are a way to stow away some clutter for viewing on a later date. The contents of the time capsule will most likely be toys from your youth and perhaps a newspaper clipping or two. This brings me to the Underground Time Capsule. It stores your capsule-worthy items in a plastic tube with a fake rock as a lid. 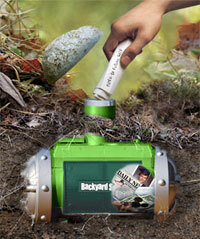 Wouldn’t making your own time capsule be much more fun? How about using an old food jar of some kind? Your children could decorate it anyway that they would like. They could even draw a map on how to find their homemade time capsule. And, you’ll have a receptacle for some of your children’s clutter before they bury it for safe keeping. The amount of creativity that is lost by purchasing such an item reminds me of the snow man kit unitasker from a few weeks ago. Is ‘trading up’ your space worth it? A family moves from a 6,000 sq. ft. home into an RV and learns valuable life lessons. Reader Christine shows us how to create a hanging file system with binder clips. You are sacrificing quality for quantity, but you are also saving space and did I mention it features a wireless network interface? I recently cleared out my video and DVD collection and got rid of most of my workout programs. The ones I liked, I watched so often I don’t need the videos any longer to do the routines. And, the ones I didn’t like, never came out of their boxes. One of the reasons I felt comfortable parting with these tapes is because I have found a terrific replacement with video podcasts on iTunes. Now, I don’t have to waste space storing videos and DVDs, and I can mix up my routines by simply downloading different video podcasts. 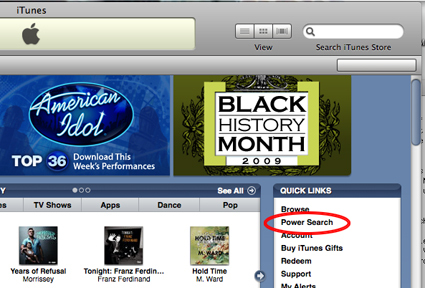 Once in the Power Search, type “Fitness” in to the Description field, choose “Health” in the Category field, and check the box “Search Video Podcasts only.” Your search results should include at least 90 programs. Try out which ones work best for you. Notes: I would describe this video podcast as American hipster yoga. Targeted to intermediate and advanced yoga practitioners, episodes range 5-10 minutes in length. The hosts are cheerful and music accompanies the routines. Notes: Host Chaz Rough creates yoga classes in response to viewers’ requests. It’s led in the more traditional style and is targeted to the intermediate and advanced yoga practitioner. I think beginning yoga practitioners would easily be able to adapt Chaz’s routines to their skill level. Now you can bring everything from TVs and computers to DVD players and more to any U.S. Best Buy store, and we’ll recycle it. Best Buy does not charge a fee for recycling most consumer electronics. However, we do charge $10 for TVs, CRTs, monitors and laptops, which is offset with a $10 gift card. We accept up to two items per household per day. Best Buy locations also offer recycling kiosks that can be used for inkjet cartridges, batteries, cell phones, CDs/DVDs, PDAs, smart phones and used Best Buy gift cards. If you live near one of the over 1,000 Best Buy locations, you can easily drop off your old electronics. Baby Plays allows parents to rotate toys in and out as their children grow, in the same fashion as the movie rental program Netflix. Using a meal plan can help keep extra inches off the waistline, save you time at the grocery store, and answer the age old question What’s For Dinner? Unitasker Wednesday: So you think you know how to eat spaghetti? Today’s Unitasker Wednesday is a 2-for-1. Both of these items will help you eat spaghetti like a machine. The size of the black cube takes up two or possibly three outlets on the strip. That’s not fair, is it? DWR has an all-white workspace packaged for one sale price. An Ikea kitchen island becomes an artist’s workbench. Simpler tools can help you eliminate distractions when writing. Comedian George Carlin humorously gives the cold, hard facts about stuff. You don’t need to be as hip and PoMo as John Freyer–who sold all his possessions online–to see the benefit of eBay as a tool for turning clutter into cash. We’ve written in the past about the Amazon Kindle and the Sony E-Book Reader being great devices to help you reduce book clutter in your home. We’ve also talked about the benefits of audio books and how you can buy them from Audible or even download them for free from your public library. 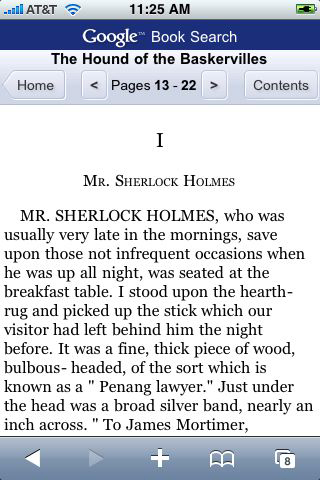 All of these digital options are fantastic ways to acquire literature in non-physical forms. Over the course of the past few months, more electronic reading options have hit the market and we wanted to bring them to your attention. If you have an iPhone, you may be interested in checking out the application Stanza. I’ve become a fan of this program, especially when I find myself in a line and I have forgotten to pack my earphones in my purse. I can be entertained by a book and instantly have another to begin reading if I finish one. If you have any type of smart mobile device, you can access more than 1.5 million books from the public domain at http://books.google.com/googlebooks/mobile/. Additionally, Google has struck deals with many publishers to provide current books and magazines to readers. No date has been set for when Amazon will make digital books available for purchase to any smart mobile device, but we’re looking forward to it. Please let us know in the comments of additional electronic services or applications that you’ve found useful for your mobile devices. I am mounting a flat screen TV over my fireplace and the cable and electric receptacles are several feet away. What is the best way to eliminate the cable clutter in order to give it a clean look? The first thing I need to say is that mounting a flat screen television above a fireplace almost always nullifies the warranty (even if you don’t use the fireplace, and even if it’s gas). Secondly, codes in your area might require that you install a plug immediately behind your television above your fireplace. In many states, it is against code to have exposed wires above a fireplace. I know this is true in Virginia because two of my close friends learned this when they recently had their homes inspected. Noting these two things, it is best for me to recommend that you hire a licensed electrician to: 1. Wire a new outlet above your fireplace, and 2. Wire HDMI cables (an any other cables you need) back through the wall to a nearby outlet. You might also consider hiring a professional installer to ensure that your TV is well secured to the wall. You will still need a component console to hold your DVR, cable box, Blu-Ray player, or whatever boxes you want to connect to your TV. Set up your component station next to the HDMI wired outlet. Then, replace the damaged drywall, paint up the patches, and call it a day (or, more likely, a week). You will have to decide if putting a TV over the fireplace is really worth it: Your TV instantly goes out of warranty, you have to pay a licensed electrician to install a new outlet that is up to code, you have to repair your wall, and you still need a console in the room to hold your components. But, for some people, the time, effort, and expense will be worth it. Thank you, John, for submitting your question for our Ask Unclutterer column. 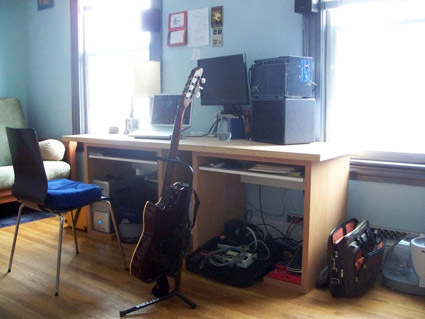 This week’s Workspace of the Week is Brendan Burns’ home studio. Brendan is a guitarist and music educator in Cambridge, Massachusetts. 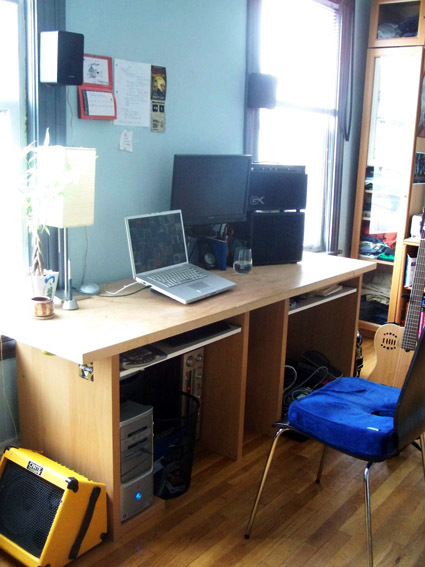 His desk is composed from two small IKEA desks with a unfinished door on top to extend the workspace. He keeps two small guitar amplifiers on the desk for amplification of both acoustic and electric instruments. A pedalboard keeps his stompboxes organized (and within foots’ reach) below the desk on the right.